A Botswana safari is a stunning holiday in its own right, but of course you’ve probably come a long way for this trip, and it would be a shame to miss any nearby highlights you’re interested in. This site is all about Botswana, but on our sister site, www.tribes.co.uk, you will find a full range of African safaris and activities which you might want to (find out) discover more about. Alternatively of course, just get in touch and we’ll talk you through the options, or email you with ideas which we think might suit you. The most common addition to a Botswana safari is some time at Victoria Falls, either on the Zambian or Zimbabwean side. 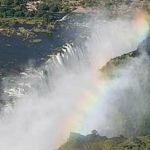 Apart from seeing the stunning falls themselves, you can enjoy activities such as flights over the falls, sunset cruises on the Zambezi, whitewater rafting, visiting local villages and more. Most people tend to have about 2 or 3 nights here, but since there are also some gorgeous lodges to relax at, you might want to stay longer. Put Victoria Falls at the start or end of your trip so that you can fly in or out of the local airport (Victoria Falls in Zimbabwe or Livingstone in Zambia). 2 nights in Victoria Falls – Victoria Falls in Zambia and Zimbabwe, makes a perfect start or end to a Botswana safari. With Botswana being land-locked, this addition obviously requires more flights, but it’s perfectly possible. You could consider South Africa, Mauritius, Mozambique or even the shores of Lake Malawi. Johannesburg would be your hub for such an extension, and we can arrange all services for you for this relaxing beach stay. 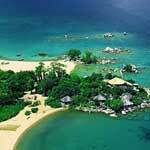 5 nights on Lake Malawi – Relax on Lake Malawi after your safari. It’s closer than the ocean! It’s not exactly nearby, but Cape Town is one of those iconic places which many people choose to include before or after a trip to Botswana. Fly back from Botswana to Johannesburg where you can pick up a flight to Cape Town for a few days’ stay. We can book you into a hotel of your choice, and also plan activities for you or leave that up to you when you get there. 5 days in Cape Town – Fly to Cape Town for a few days in this famous cosmopolitan city before or after your Botswana safari.